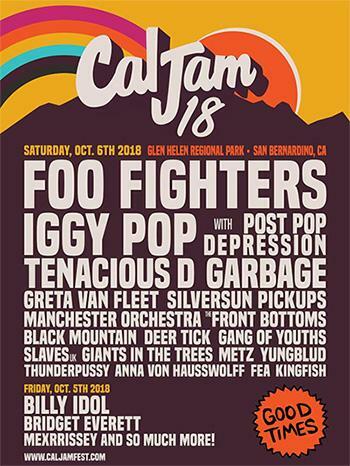 A year after the legendary debut weekend from which 30,000+ true rock believers have barely recovered... Cal Jam 18 is back for another weekend of joyful rock-n-roll abandon featuring 20+ bands on four stages this October 5-6, 2018. Promoted by Live Nation, the festival returns to Glen Helen Regional Park and Amphitheater in San Bernardino, CA, for an even more monolithic second incarnation of what the Los Angeles Times cited as the reason fans "come to music festivals: to feel connection and catharsis." Today, the festival has announced its guitars, guitars and more guitars lineup with Foo Fighters back as headliners and curators, and another once in a lifetime bill that proves that rock-n-roll is alive and well in California. The good times come at the affordable price of $99 (plus taxes and fees) for one day GA. This year, Saturday ticket holders have the option to buy a Friday night ticket for $30 (plus taxes and fees). All camping packages include free entrance to the Friday night Party. Tickets and camping packages go on sale this Thursday, May 17th at 10AM PST. Visit www.caljamfest.com and www.LiveNation.com for more information. The good times begin with the Friday night party on October 5th, where those with camping passes and Friday night tickets will be invited to kick off the festival with 80s punk legend Billy Idol. Also on the bill is Bridget Everett, the comedian who Jerry Seinfeld called, "one of the greatest live performers I have ever seen in my life, "and Mexico City's Mexrrissey, performing their set of Smiths and Morrissey cover songs in Spanish, plus so much more. Friday night attendees will also have first crack at the carnival rides and the Rock-N-Roll Museum. 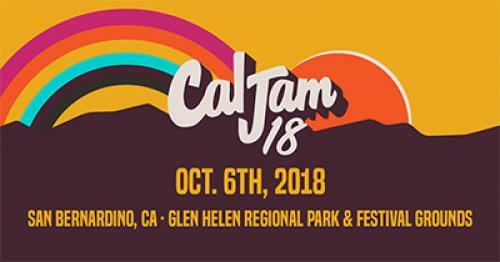 On Saturday, October 6th, Cal Jam will continue last year's tradition of a 12-hour rock extravaganza where anything can happen-literally anything: last year saw the likes of Joe Perry of Aerosmith, Rick Astley, Dave Koz, Liam Gallagher and more joining the Foo Fighters on stage (yes, all during the same show). Foo Fighters will close the proceedings with one of their traditional rock marathons, bringing back what Forbes called "another great rock and roll party from the band who does them better than anyone else today." And where last year's inaugural festival was the beginning of the Foo Fighters' Concrete and Gold Tour, this year's appearance brings it full circle as the tour's final show in the LA area. This year Dave Grohl and crew will be have set themselves up to play after literally the single hardest act to follow in the history of live music: the legendary Iggy Pop. Iggy's Cal Jam 18 performance will be an exclusive one-off reunion with the all-star Post Pop Depression band that backed him on the handful of shows played in support of the album of the same name, featuring Queens of The Stone Age's Joshua Homme, Dean Fertita and Troy Van Leeuwen and Arctic Monkeys' drummer Matt Helders. The incomparable Jack Black and Kyle Gass of Tenacious D will bring 'The Metal' to the masses, and alternative pop-rock icons Garbage will be bring their powerhouse live show to the stage. Also joining the bill will be some of the best that rock and roll has to offer from around the world with the likes of Greta Van Fleet, Silversun Pickups, Manchester Orchestra, Krist Novoselic's new band Giant In The Trees, Slaves (UK), Gang of Youths, Black Mountain and more performing throughout the day. See full list below. In addition to the full day of shred, the festival will include a number of activities open to attendees. Campers will be treated to outdoor midnight movies and access to the water park. As well as the newly christened Friday Night Comedy Tent curated by comedian Tim Hanlon (aka Dave's cousin). Stay tuned for the full schedule to be announced! All ticket holders will be able to enjoy the site's free carnival rides, the Rock-N-Roll museum, pop up record shop and a hillside full of flappy guys. Because we can. For those who are looking to imbibe in tasty eats and cold drinks, Cal Jam 18 offers a wide variety of curated food trucks, traditional festival food, and all sorts of delicious delicious cold beer. Billy Idol, Bridget Everett, Mexrrissey + More!